Many inboard-powered boats have been built with thru-hull exhausts and fairly free-flowing mufflers. If that constant roar while underway is getting to you, there are several solutions to tame it. 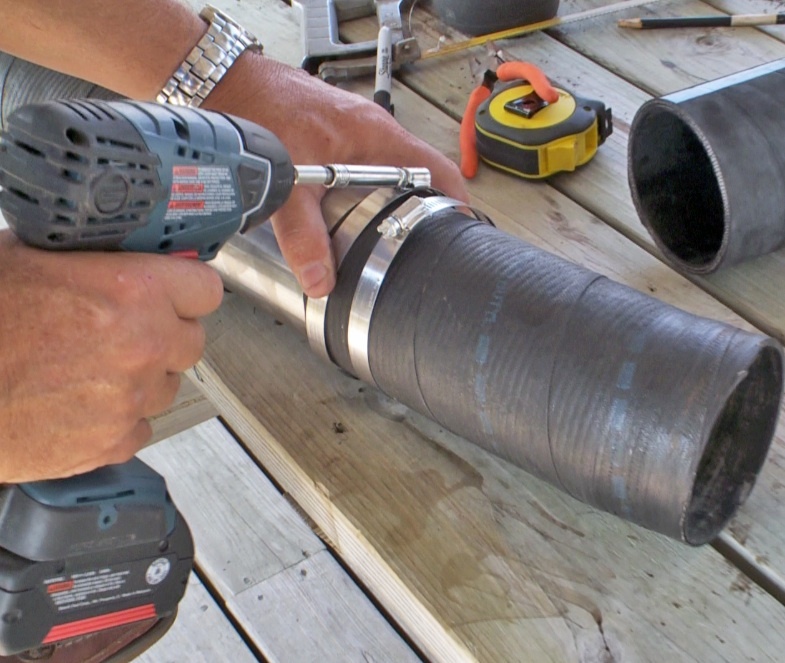 The first and probably more obvious option would be replacing your boat’s mufflers. However, while straight forward, this can be a very costly upgrade. GGB Exhaust in Burks Falls, Ont., offers an excellent alternative. Owned by Graham Barkey, the company has developed a complete range of inline mufflers, first for the performance marine market and now for recreational boats and cruisers. The mufflers are simplicity themselves – albeit highly researched, engineered and tested. GGB offers both inline systems and inserts. The functionality is the same, but the inline models are encased in a stainless steel tube, installed in the exhaust hose and later inserted into three- or four-inch open exhaust tips. Installation of the GGB Mufflers is a straightforward DIY project, but it will take two to tackle it. For our project, four four-inch inserts would be installed ahead of the original fibreglass mufflers. Before installing the new inline mufflers, our first task was to record the current decibel level of the exhaust. Readings were taken one metre off the transom (one metre up), with the twin MerCruiser 7.4-litre inboards revving at 1500 rpm hitting 92dBA. First the exhaust hose clamps were loosened and the hoses were removed from the exhaust elbows and mufflers on both engines. 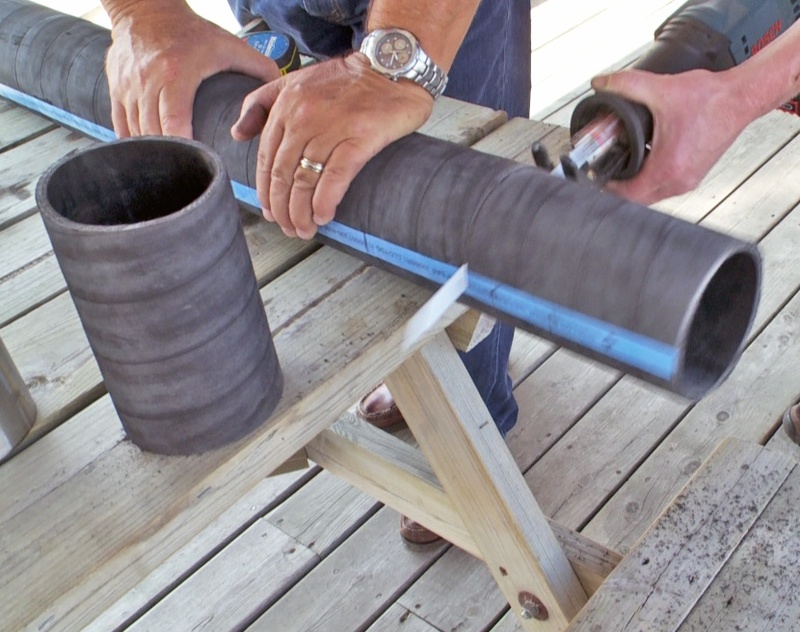 After measuring the length of the original exhausts and deducting the measurement of the exposed portion of the mufflers, two sections of new exhaust hose were cut for each new inline muffler. A reciprocating saw with a metal blade made quick work of the rubber and wire core. 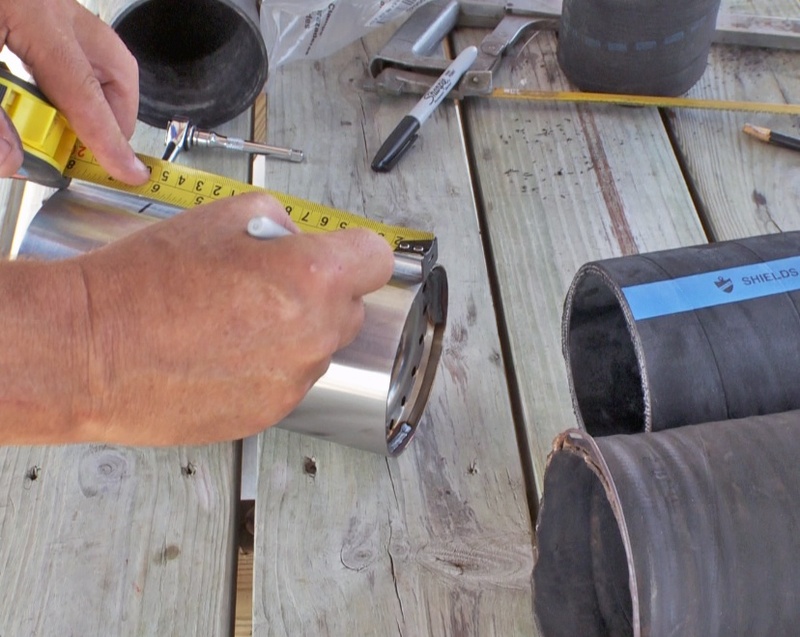 To ensure the exhaust hose sealed tightly to the stainless steel mufflers, two-inch insert depths were measured and marked on each end of the mufflers. Next, dish soap was applied to the inside of the hoses and then the hoses were slid into position on each muffler and double clamped with new stainless hose clamps. 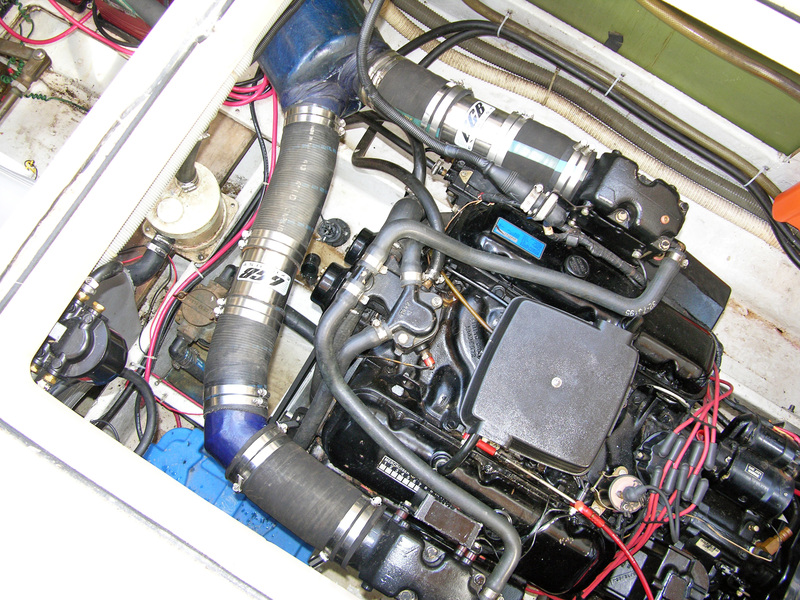 With all four sets of mufflers and hoses assembled, it was back into the boat to install them on both of the MerCruiser 454s. This really is a task that requires two people, soap for lube, and some muscle and finesse. With all of the hoses in place, a power driver was used to speed up securing the hose clamps. With one set of muffles installed, Graham and I worked somewhat quicker on the second engine. After about two hours, both engines were outfitted with the GGB Exhaust inline mufflers and ready to be fired up. Once again bringing the big block up to 1500 rpm, I took a reading of the sound level and recorded 89 dBA – a significant drop at idle (sound readings are not linear, so a change of 3 dB is a multiplier of 1.4 times the level). While the sound level at fast idle was reduced, the addition of the mufflers would be most appreciated at cruise, where the incessant roar of the original free-flowing exhaust systems would be tamed. This My Boat project is featured in episode 6 of the 2014 Season of PowerBoat Television.